ARMY EXPERTS HAVE successfully dealt with a homemade bomb that was found outside a house in Tallaght in Dublin this evening. 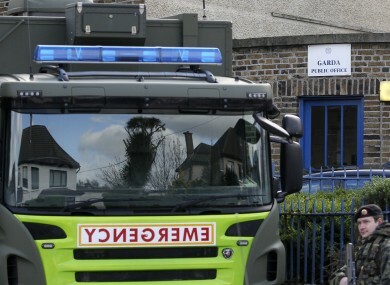 The Army Bomb Disposal Team were called to the house in Jobstown at about 5.50 pm after being informed by gardaí that a member of the public had found the device. A cordon and road closures were put in place in the Glenshane area where the device was found and a number of houses were evacuated. The team assessed the viable device and it was made safe without the need for a controlled explosion. The device was then brought to a secure military location where it is to be examined until it is handed over to gardaí. Email “A homemade bomb was found outside a house in Tallaght this evening”. Feedback on “A homemade bomb was found outside a house in Tallaght this evening”.